the men’s tournament in cincinnati and the women’s tournament in toronto both ended today. roger federer beat american james blake 6-1, 6-4 without very much trouble while justine henin beat jelena jankovic 7-6(3), 7-5 in what was probably in the top 10 matches of tennis that i’ve personally watched. henin was down 4-1 in the first set before coming back and winning in a tiebreak. in the second set, jankovic was down 15-40 in two of her services before winning 5 straight points for a win. they were tied at 5-5 when they had the best game of the day. that game saw 9 deuces before henin finally won. so with cincinnati and toronto done, men’s and women’s tennis are ready to begin the US Open. the US open was the first open event to adopt the use of hawk-eye to decide questionable line calls. this will be the third year that the hawk-eye system is present at the US open. when a call is challenged by one of the players, the hawk-eye system provides an animation which shows where the ball supposedly landed. there has been some controversy over the last year. in Dubai, there was a call that was challenged and ruled in, but the ball mark was clearly out. then in the Wimbledon final, Nadal challenged a call and it was ruled in. the television replay showed that it was out by at least 2 cm. me, brian and gavin were talking about hawk-eye (called spot shot on espn) and how we don’t understand how it works or how accurate it is. with all of the controversy we were confused as to why there were never any presentations done during breaks in matches to explain how the hawk-eye system works and what the margin of error is. the hawk-eye system was invented by a dr. paul hawkins. he later founded hawk-eye innovations which is a company with 38 employees centered in the UK. dr. paul hawkins was a cricket player as a youth and he originally designed it to help television audiences see whether a ball that hit a batter would have hit the wicket or not. 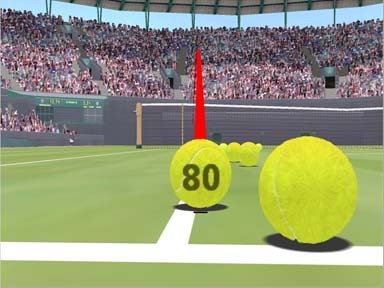 in tennis matches where hawk-eye is used, there are 10 cameras that take readings every frame on the positions of the ball and the lines. the composition of the data on position collected by the 10 cameras is used to determine the 3 dimensional position of the ball in each frame. then all the different positions are put together to give a continuous trajectory of the ball. 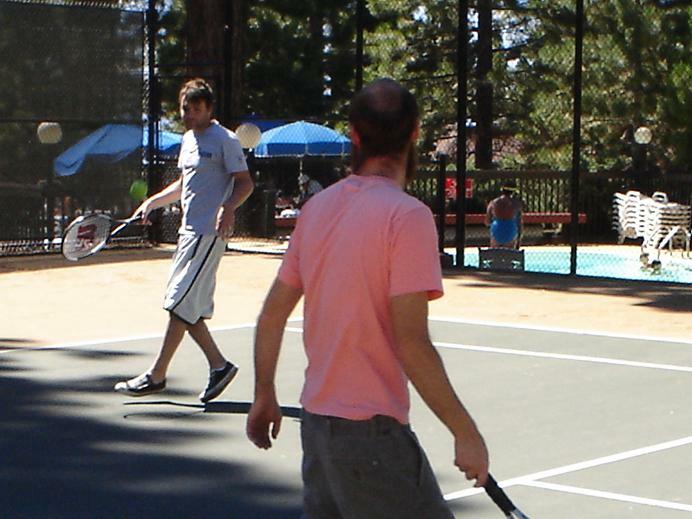 the trajectory of the ball is then used to complete the picture of where the ball touched the ground. sounds pretty good. so why the controversy? on the hawk-eye website, they give explanations for both Dubai and Wimbledon. they provide some good arguments, but they gloss over the controversy and dismiss any counter-arguments as absurd. also, on their website they claim that the hawk-eye was 100% accurate with an average error of 3.6mm in the ITF testing which took place over the course of one day back in 2006. statistics that good make anybody a little bit suspicious. 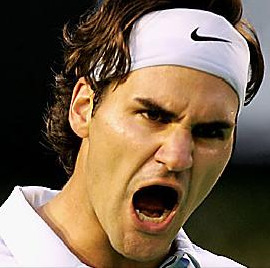 the most famous critic of the hawk-eye system is roger federer. “It’s a weird thing I still don’t trust 100 percent, I probably never will.” he says that he would rather just have the line judges. “I think they do an excellent job – I wouldn’t want to be sitting on that line. I just get disappointed when they miss shocking (calls). But that can happen too.” so why does federer use challenges if he doesn’t trust hawk-eye? “why not challenge? I would kill myself if it was in and I had not challenged.” also, after the Roger’s Cup, he admitted that one of the times he challenged not because he thought the line judges made a mistake but because he thought the maybe hawk-eye would make a mistake in his favor. i think the hawk-eye system is pretty cool overall. but i see the problems with it and i think hawk-eye should just own up to the fact that it’s very accurate but not 100% accurate. and maybe until it gets better (with high speed cameras? 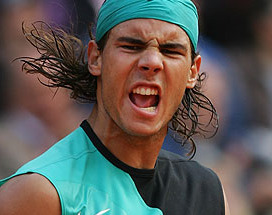 ), i’ll side with rafael and roger that it doesn’t do all the wonderful things that everyone says.